Comfortable, private 3+ bedroom house on the ocean -- private path to the beach. Post and beam construction, cathedral ceiling. 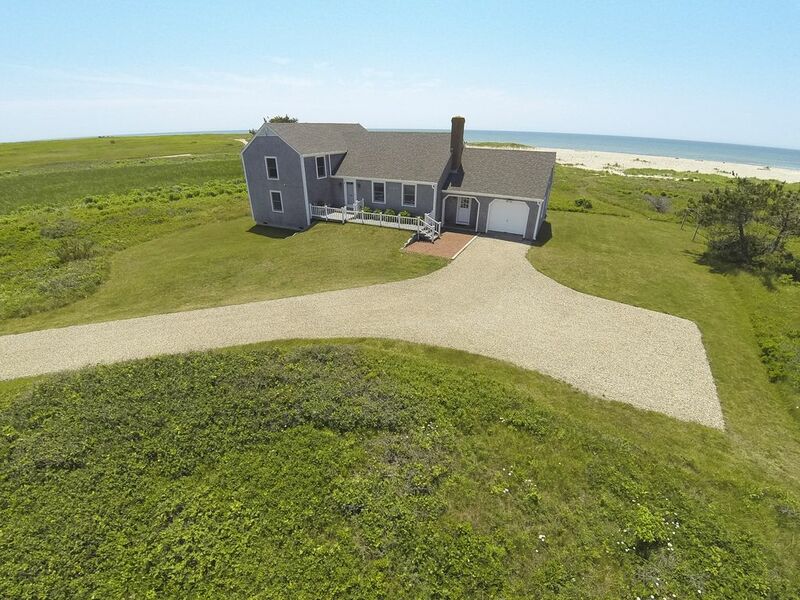 Spectacular panoramic views of the ocean, pond, and moors. Multi-level decks on ocean side; landscaped yard great for games with kids. Pets: well behaved, house-trained dogs are allowed with prior approval by owner. Nantucket has several bike rental agencies that deliver and pick up. We had a great stay at 'Seaduced'. The house was plenty big for (4) adults and (4) kids. The grass area next to the house was a nice spot for the kids to play wiffleball, soccer, etc. The views from the deck / balconies are awesome. For those looking for a secluded house on the beach, I highly recommend. First the basics - Seaduced is exactly as advertised, the listing and pictures are accurate, the house is clean and well maintained, the owner was pleasant, helpful and honest, we would recommend staying here to anyone and the beach is right out off the deck. My wife and I stayed here for a week with our adult sons, their significant others, our dog and my wife's mother. It was the perfect choice - everyone had their own sleeping space and plenty of common area to enjoy eachothers' company. All the room are fully furnished. None of the rooms are small. Perfect! The main living area is comprised of the entrance, kitchen, dining room and living room (all open), from the main level 3 steps down to two bedrooms and a jack and jill bath, from the main level 6 steps up to two bedrooms and a jack and jill bath. All those rooms have swinging or pocket doors. Nice! The house is outfitted with everything you need for a week at the beach - ample kitchen with cookware, tools, appliances, dishes, glasses, flatware, etc. ; beach chairs, towels, umbrellas, boards, kites, etc. ; gas grill; deck furniture; a garage for the car; grass area for the dog; a path through the brush to the private beach; outdoor shower. Wonderful! When we arrived the house was spotless, all the beds were freshly made, plenty of blankets, towels, and pillows. Convenient! The house is very secluded, it is on an easy to navigate dirt road, directly on the beach, NOT within a stones throw of the next house. If you see another person, you take notice. Private! Pleasant sea breezes, the sound of the surf 24/7, beautiful sunrises, sunsets and moonlit, starry nights. Spectacular! This is my 3 rd year renting "Seaduced" and it is by far one of the most perfect vacation homes and places that I've experienced. The owners are gracious, honest, helpful and a pleasure to deal with. the home is a minutes walk to the beach and walking trails through the moors are just steps away. The home is comfortably furnished and includes all the amenities one could ask for. Every view is outstanding with upper and lower decks . Nature abounds. It is a glorious place and truely a home away from home.